Will Russia's New Armata Tank Come Loaded with a 'Super' Gun? The history of a project that has taken years to bear any fruit. The 125mm D-91T or 2A66 “Anker” tank gun was expected to defeat almost any NATO tank when it was designed. It incorporated numerous advanced features in its design and the design of the ammunition for it. Despite its numerous advantages, it never was adopted due to it’s increased cost and the lack of backward compatibility for earlier ammunition. Now that Russia is fielding the 2A82-1M gun on the T-14 Armata, what can we learn from the last serious project to make a “super” 125mm gun? The 2A66 project was created out of the fear that the then-current 2A46 gun—which armed the Soviet Union’s T62, T72, and T80 tanks—would be rendered ineffective by advances in NATO armor technology. The 2A66 was designed to handle overpressure ammunition relative to the 2A46, and thus had a longer barrel and notably a muzzle brake to help control the blast and fumes from a more powerful shell. Unlike earlier Soviet muzzle brakes, such as those on the IS-series, the 2A66’s muzzle brake did little to reduce the force itself and was primarily used to divert gasses  from the line of sight. Despite these improvements, the 2A66 largely retained the same internal dimensions as the 2A46, as the original design called for it to be retrofitted to all Soviet tanks as an upgrade. 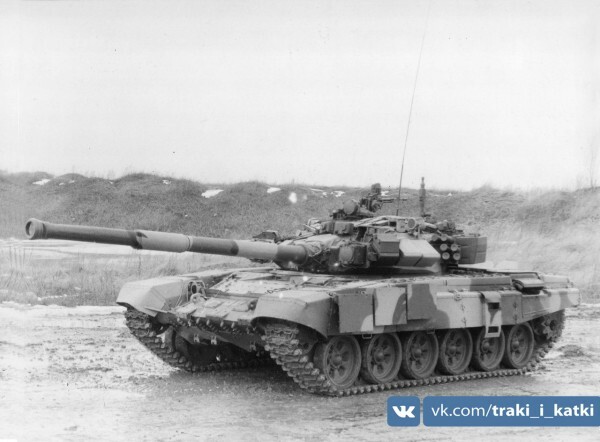 One such example is a prototype T72B armed with a 2A66 . But while the external dimensions largely remained the same, the internal dimensions changed quite a bit. A new series of ammunition was also developed for the 2A66, utilizing depleted uranium: the “Anker-1” and “Anker-2” APFSDS rounds, as well as novel HEAT and GLATGM rounds. But the increased pressure of the new Anker rounds required an increase in chamber volume. This made it unable to load previous 125mm rounds. However, engineers realized that the cost of reequipping all Soviet tanks with the 2A66 and new ammunition would be prohibitively expensive. As a result, the 2A66 was relegated to become the armament of future tank designs—before being deemed insufficient and shelved in favor of 152mm designs . Before it was shelved, the 2A66 equipped the Objekt 188, 187 and 490A prototype tanks. The Russians appear to have learned from the 2A66 experience. The Armata’s new 2A82-1M gun is to be backward compatible with standard 125mm ammunition (it is reportedly able to fire all standard 125mm ammunition types regardless of penetrator length, due to the new autoloader design), while also largely retaining the same dimensions  of the 2A46M tank gun. Indeed, one of the possible components of the T-90M upgrade is the replacement of the 2A46M gun on the T-90 with a 2A82. While the 2A66 project is dead, its development gave the Russians valuable experience in optimizing the 125mm gun to reach higher barrel pressures and velocities while still maintaining the same form factor. Now they are reaping the rewards in the T-14 Armata. One can only hope the United States does the same from their XM360 tank gun program.